An overview of the Learning Conversation and placemat process. Client census—new and active—over the past four years for each program. Client geographic distribution heat map. This placemat was interactive, using Tableau. We wanted not only to show the geographic distribution of clients in Massachusetts, but also to provide an opportunity to explore the data further, through the use of filters for program and key demographics. A network analysis showing referral sources. 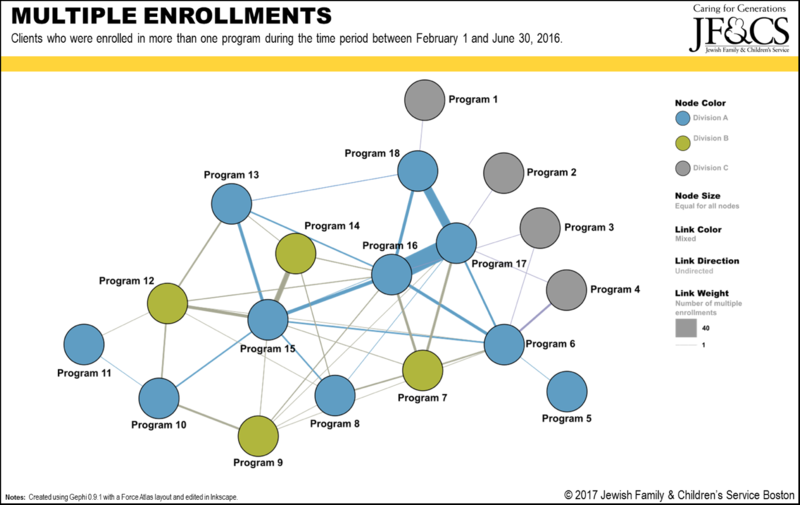 A network analysis showing how clients were served by multiple programs at the agency. 7. A learning and dissemination plan. This placemat encouraged meeting participants to use the data and allow our team to create specific follow-up documents and undertake follow-up analysis. During the planning stages, check-in with stakeholders from around the organization. We asked the program director, division director, grant writers, and development associates what they wanted to learn about the division. Their responses allowed us to tailor the placemats to be as useful to as many people as possible. Don’t forget to include the staff! In order to share the placemats and get feedback from the direct-service staff, at an all-staff meeting we held a shorter placemat discussion, focusing on two placemats; the other placemats were provided for later review. We also hung up the placemats near the staff offices and provided sticky notes for feedback and observations. Be ready to “go on the road” with your placemats. We found that word spread about our placemats and there was interest from various stakeholders who had not been able be part of the original few meetings. By continuing the conversations, we were able to increase learning and generate new ideas. Bring data chocolates! We had been waiting for an opportunity to create data chocolates, after being inspired by Susan Kistler. We wrapped shrunken versions of several of the graphs around chocolates. They put everyone in a good mood to talk data—the lightheartedness of our gesture helped break down barriers and were a great conversation starter. For a thorough description of data placemats, see the 2016 article entitled “Data placemats: A facilitative technique designed to enhance stakeholder understanding of data” by Veena Pankaj and Ann Emery in New Directions for Evaluation. An AEA365 post by the Innovation Network about participatory evaluation techniques, which includes a guide. Slides from a webinar by Genevieve Martinez-Garcia, Ph.D. of the Healthy Teen Network, on data placemats, including detail on creating them in PowerPoint. The American Evaluation Association is celebrating Internal Evaluation (IE) Topical Interest Group Week. The contributions all this week to aea365 come from our IE TIG members. Do you have questions, concerns, kudos, or content to extend this aea365 contribution? Please add them in the comments section for this post on the aea365 webpage so that we may enrich our community of practice. Would you like to submit an aea365 Tip? Please send a note of interest to aea365@eval.org. aea365 is sponsored by the American Evaluation Association and provides a Tip-a-Day by and for evaluators.